Choosing to eat better and live a healthier lifestyle can be difficult for anyone who is on the go or simply has trouble planning meals in advance. 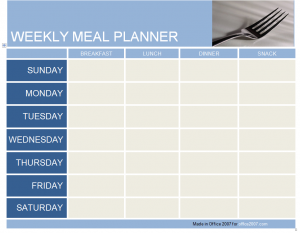 The Weekly Meal Planner Template is a simple and effective way to track, organize, and plan your meals for the whole week. Using the link below, download the template and open it in Word. The one-page document shows a simple calendar of Sunday through Saturday with columns for breakfast, lunch, dinner, and a snack. Go through each day and enter what you plan to eat. You can either go by day, or start by filling in just the breakfast column, for example. If you have multiple items, separate them with commas. Once your meal plan is filled in for the week, you’re finished. You can change the title “Weekly Meal Planner” to include the dates that plan applies to. If you’re unsure what you’ll eat for a certain meal, don’t leave it blank or you may resort to junk food. Instead, enter in something you know you can make that’s good for you, such as “salad” or “chicken”. Make your list in advance so you can prep meals in advance, too. An easy way to do this is to make multiple servings of something like cold veggie pasta and store it for throughout the week. Print the filled out template and display it in a visible place to hold yourself accountable.